Showing 1 - 7 of 7 articles tagged "Mirai Nagasu"
Was Mirai Nagasu a "jerk" for saying her final Winter Olympics performance was a Dancing with the Stars audition? 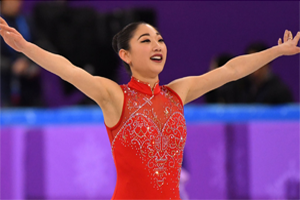 Nagasu apologized over the weekend for her "bizarre" press conference that followed her finale at the PyeongChang Games. The snowboarder tells Yahoo News that he fell asleep with his teammate while watching the Fox comedy on Netflix.